Evangelion shares his philosophical leaps with MapleStory for a landmark crossover: MapleStory X Evangelion. 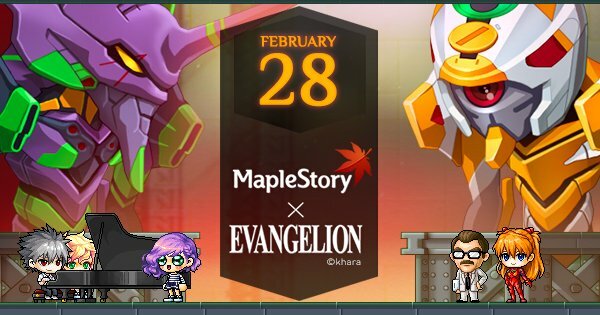 The mythical Japanese anime and the ancestral MMORPG mix from February 28th: ​​Evangelion characters accidentally meet in Maple World after crossing an interdimensional crack, allowing MapleStory players to interact with them for a slew of special events and unpublished quests. The mechas pilots are somewhat lost in their new environment. To help them become familiar with Maple World, players will have to perform various side quests. Interacting with Shinji, Rei and Asuka allows all players to recover EVA Coins to spend for various items available for a limited time, but at the same time it will be necessary to repel the successive waves of Angels who are trying to invade this time. Maple World. Evangelion Coin Shop: Evangelion events and quests reward players with EVA Coins, to trade for limited time items such as chairs, medals and even permanent equips. Evangelion Style Boxes: For a limited time, players can purchase Evangelion surprise boxes filled with new accessories and outfits to dress their MapleStory characters in the iconic style of the anime. Exclusive Items: Players can also purchase special boxes and open them to get Evangelion-typed items like androids or coupons for new haircuts, making them look like anime characters.